VATICAN CITY (CNS) — Christ’s commandment to love God and neighbor is a path trodden by those who have the desire to become saints, Pope Francis told thousands of altar servers from around the world. The pope presided over an evening meeting and prayer service with some 60,000 altar servers making an international pilgrimage to Rome. The majority of young men and women came from Germany, but there also were pilgrims from Italy, France, Austria, the United States and other countries. 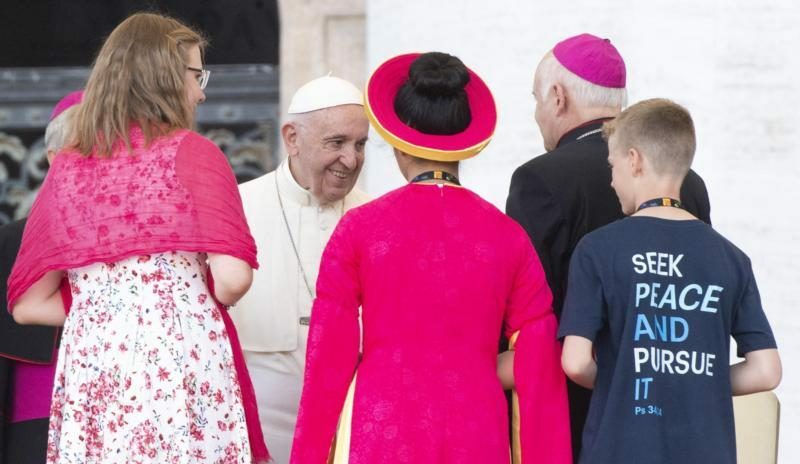 After circling St. Peter’s Square in his popemobile, Pope Francis smiled brightly as Bishop Ladislav Nemet of Zrenjanin, Serbia, waved his arms and urged the young men and women to welcome the pope with cheers and applause. Bishop Nemet is president of Coetus Internationalis Ministrantium, the association of altar servers that hosted the meeting along with the German bishops’ conference. Before the event, the Vatican fire department used hoses to spray water over the seats in the blistering Rome sun in an effort to cool them down. The firefighters stayed once the pilgrims were allowed into the square, creating cooling showers for the much-needed relief of the young people. “You are very courageous to be here since 12 p.m. in this heat!” the pope told the young people before responding to questions posed by servers from Luxembourg, Portugal, Antigua and Barbuda, Germany and Serbia. One server told Pope Francis that like many of his fellow altar servers, he was saddened “to see how few of our own age group come to Mass” or participate in parish life. “How can we — and our communities — reach out to these people and bring them back to Christ and to the family of the church?” he asked. “If we can do this, if we really put it into practice, we will bring Christ’s peace to our everyday lives. Then we will be peacemakers and channels of God’s peace,” he said. Before continuing with the prayer service, Bishop Nemet thanked the pope for his words. However, the pope wanted to make sure the altar servers were happy. “Ask them if they feel encouraged after I answered their questions,” the pope told Bishop Nemet. After the bishop relayed the pope’s question, the 60,000 young servers erupted in cheers and applause. Recalling the feast of St. Ignatius of Loyola, Pope Francis said the Jesuit founder “discovered the heart and meaning of life itself” through seeking the glory of God and not his own glory.